be ready to receive guests. I am merely carrying out his wishes. The film begins where the 1958 film Horror of Dracula, also directed by Fisher, left off, reminding us of Dracula's death ten years ago. Four English travellers - the brothers Charles and Alan Kent and their wives - are stranded and find themselves guests at the castle of Dracula, whose servant Klove (Philip Latham) informs them that his late Master left instructions for visitors always to be welcomed. 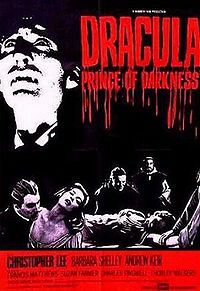 That night, he kidnaps Alan (Charles Tingwell) and uses his blood to resurrect Count Dracula (Christopher Lee) from his ashes. He then lures Alan's wife Helen (Barbara Shelley) to the Count, who bites and vampirizes her. Charles (Francis Matthews) and Diana (Suzan Farmer) are confronted by Helen and the Count, but manage to escape, eventually finding refuge in a local monastery with vampire hunter Father Sandor (Andrew Keir), whom they had met earlier. With the help of Ludwig (Thorley Walters), an eccentric, bug-eating lunatic reminiscent of Renfield, Dracula enters the monastery and takes Diana to his castle, while Helen is captured and staked. Sandor and Charles chase Dracula back to the castle, where the Count meets his demise when the ice covering the castle's moat cracks and he falls into the running water he can't escape. The last shot shows him not dead but merely trapped under ice.